Ferrite Magnets - Magtech Magnetic Products Corp. The ferrite magnets standing for ceramic magnets feature the good resistance to demagnetization and have good corrosion resistance. This class of permanent magnet is hard and brittle so as not to be exposed to high compressive forces. The hard ferrite magnets have high coercivity, meaning that the materials are hard to become demagnetized. Literally, it doesn’t demagnetize and be rust easily. 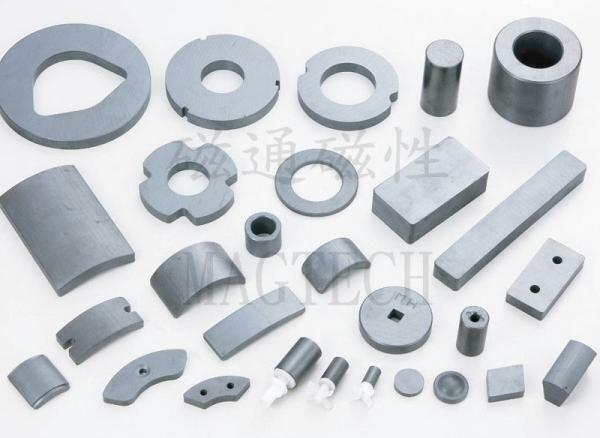 The ferrite magnets including “Isotropic” and “Anisotropic” are sintered magnet with either by dry pressed or wet pressed. Tooling is always needed when pressed. The key advantage of ceramic magnets is that it can be magnetized with multiple poles if necessary. That is to say, the magnetization can be done by axially, radially, multi-poles axially, and multi-poles on circumference etc. Due to the low cost, medium power and productivity by mass production, the ferrite magnets are widely used in various industries for many different applications like refrigerator magnets, loudspeakers and small electric motors. They are considered as the most popular one in magnetic materials for past about 30 years. And we are the reliable supplier to offer you high performance products that you can benefit from.